^ Page 46, Dr. Jadoan, Atar Singh (September 2001). Military Geography of South-East Asia. India: Anmol Publications Pvt. Ltd. pp. 270 pages. ISBN 81-261-1008-2. Retrieved 8 June 2008. ^ a b "The Deccan Peninsula". sanctuaryasia. Archived from the original on 17 October 2006. Retrieved 2007-01-05. ^ "The Deccan Plateau". rainwaterharvesting.org. Retrieved 5 January 2007. ^ Henry Yule, A. C. Burnell. Hobson-Jobson: The Definitive Glossary of British India. Oxford. ISBN 9780191645839. ^ Monier-Williams Sanskrit-English Dictionary, p. 498 (scanned image at SriPedia Initiative): Sanskrit dakṣiṇa meaning 'southern'. ^ Richard M. Eaton 2005, p. 2. ^ World Wildlife Fund, ed. (2001). "South Deccan Plateau dry deciduous forests". WildWorld Ecoregion Profile. National Geographic Society. Archived from the original on 8 March 2010. Retrieved 5 January 2007. ^ "South Deccan Plateau dry deciduous forests". Terrestrial Ecoregions. World Wildlife Fund. Retrieved 5 January 2007. Chisholm, Hugh, ed. (1911). "India" . Encyclopædia Britannica. 14 (11th ed.). Cambridge University Press. pp. 375–421. ^ a b Marshall Cavendish Corporation (2008). India and Its Neighbors, Part 1, p. 335. Tarreytown, New York: Marshall Cavendish Corporation. ^ Richard M. Eaton 2005, p. 83. ^ Richard M. Eaton 2005, p. 88. ^ Benichou, Lucien D. (2000). From Autocracy to Integration: Political Developments in Hyderabad State (1938—1948), p. 232. Chennai: Orient Longman Limited. ^ Ottens, Berthold (1 January 2003). "Minerals of the Deccan Traps, India". HighBeam Research. Archived from the original on 11 September 2016. Retrieved 8 August 2016. 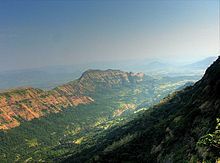 ^ "Deccan Plateau, India". Encyclopædia Britannica. Retrieved 8 August 2016. 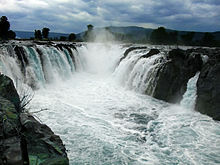 ^ Subramanian, T. S. (20 March 2011). "Massive uranium deposits found in Andhra Pradesh". news. Chennai, India: The Hindu. Retrieved 8 August 2016. ^ Thakur, Monami (19 July 2011). "Massive uranium deposits found in Andhra Pradesh". International Business Times. USA. ^ Bedi, Rahul (19 July 2011). "Largest uranium reserves found in India". The Telegraph. New Delhi, India. ^ "Peninsular India". ita. September 1995. Retrieved 8 August 2016.